Before moving into our home in January 2013 we needed to fix the fireplace in the kitchen. 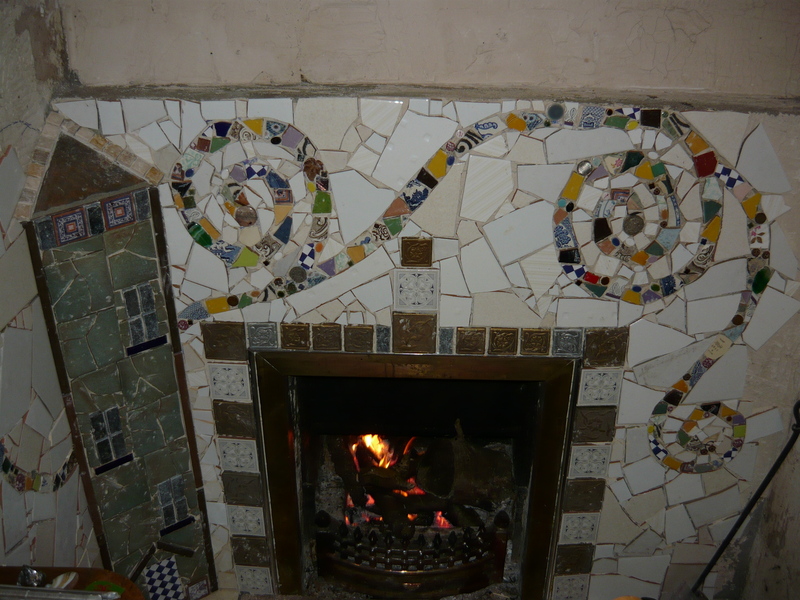 It is an open fire that has a back boiler and the hot water it produces can be used for baths and to heat the radiators. Unfortunately it had not been properly installed so there was a huge cavity next to the boiler and fumes could escape into the kitchen. 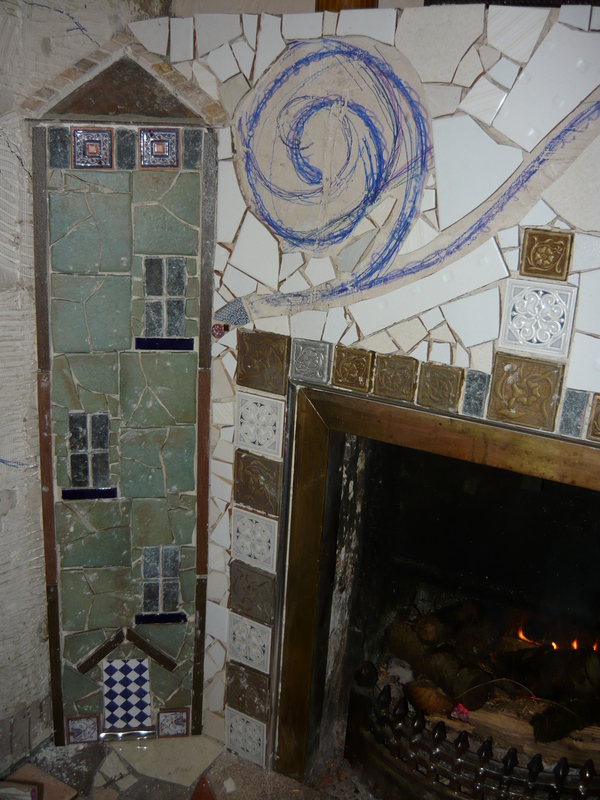 The fireplace was nicely tiled but all of it had to come down, due to the repairs we had to carry out. So we were left with a blank canvas. 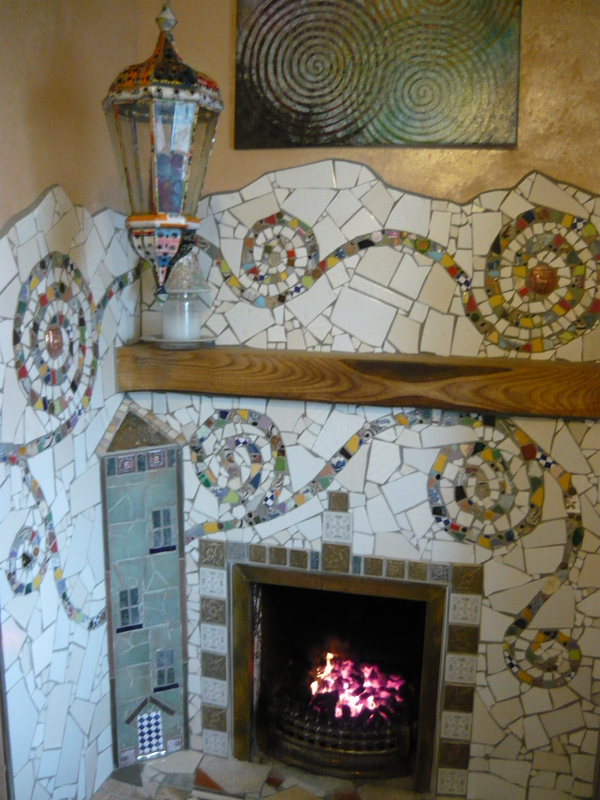 We wanted to reuse the white tiles that had been on there and the ones taken of the kitchen walls as well as some white tiles friends had given us. We also wanted to incorporate a lot of pieces of broken plates and china. Every time we go for a walk we always keep an eye open for pieces of broken crockery. We have found some lovely pieces in the garden of our house as well, when planting trees and shrubs. They are especially nice to include as they belong to the history of the house. Some of them could go back to the 1920s when the house was built. As we are a family of six with no dishwasher, we also get quite a few broken pieces of our own. In fact our dinner plates are all old, some from our parents and grandparents and whenever we see a nice old pattern in the charity shop we buy it, even if it is just one or two plates. 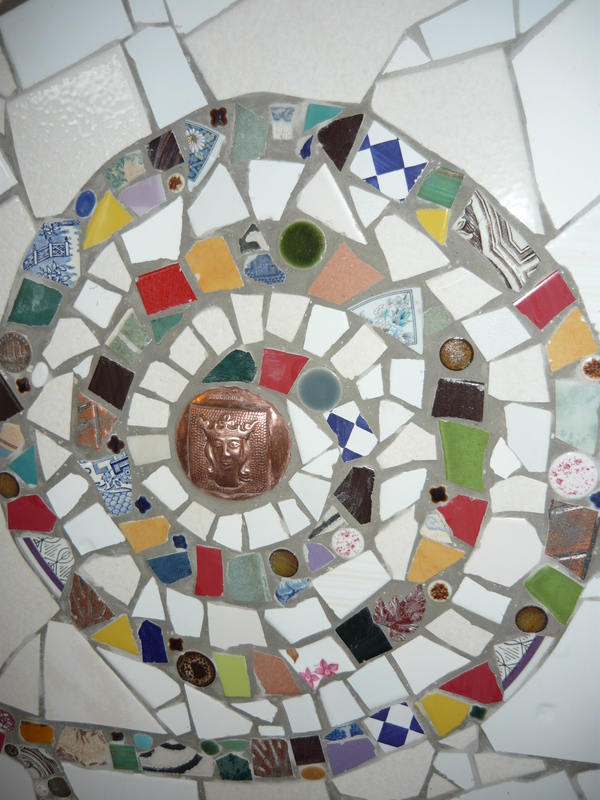 In this way it does not matter when a plate breaks as we will be happy to recycle it in a mosaic project, and there are always replacements at the ready. Including old crockery, coins and memorabilia really makes your tiling project unique and personal. 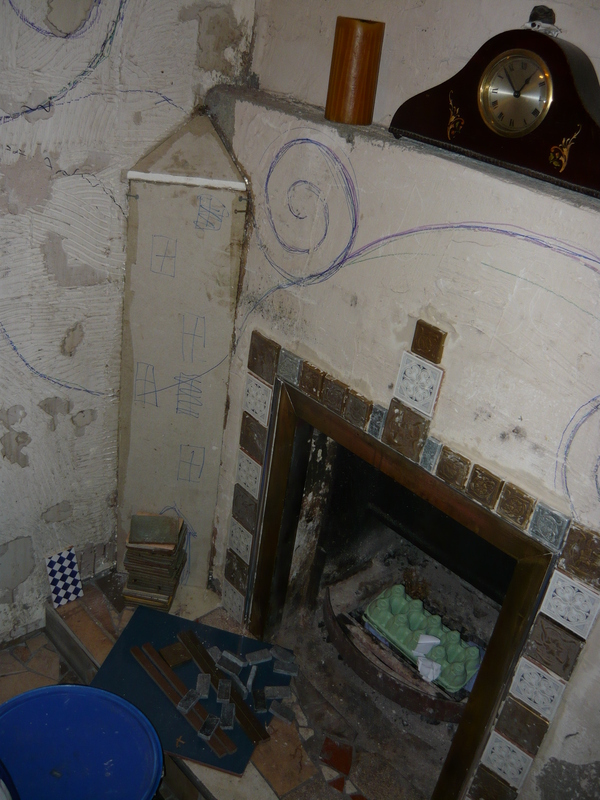 Our apologies as some images are slightly out of focus, but they will still give you an idea of the project. There were a couple of pipes going from the back boiler to the tank and we had to build a cover for them. When it was done it looked so much like a house, that we had no choice but to make it into one. To bring some energy into the design we decided to make swirls and spirals from all the small crockery pieces, representing movement and gusts of wind. All our white tiles were used as a calming background to the colourful swirls. For a job like this, the readymade tile adhesive you can buy in a big tub or bucket is the best thing. We used small plastic toothed spreaders, which you can get in your tile or hardware shop. It is a fiddly job but very meditative and rewarding. Keep checking that your work is flat by putting the palm of your hand against it. Only spread the adhesive over a small section at a time. When it was all set and dry we used the powdered grout, mixing some grey and white for a nice colour. Follow the instructions on the package and keep wiping all your little pieces carefully when the grout is half hard to remove it from the tops but leave it in the gaps. A second grouting might be necessary. We also added a big Ash log for a mantle piece. 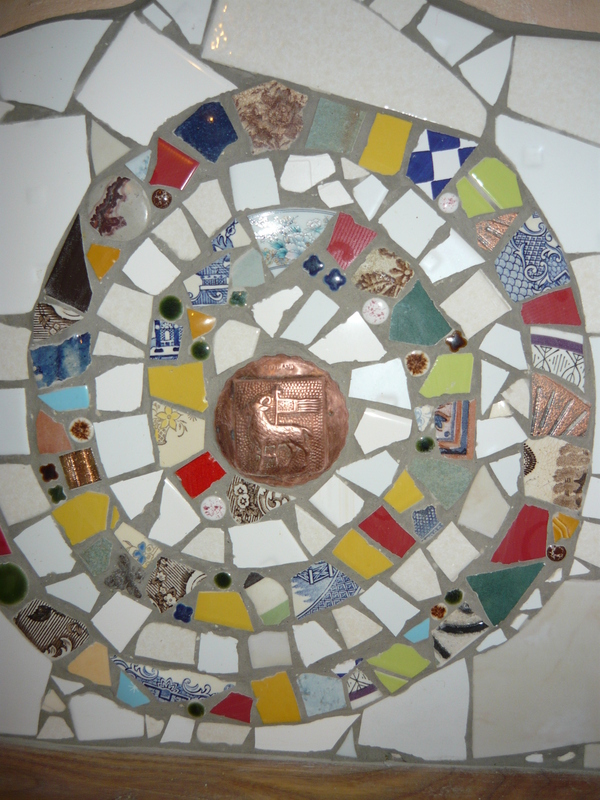 We found the lovely metal tiles around the frame in a tile skip outside our local tile shop. They were happy for us to take away as many tiles as we wanted, but please remember to bring gloves and ask politely if you are planning an excursion. 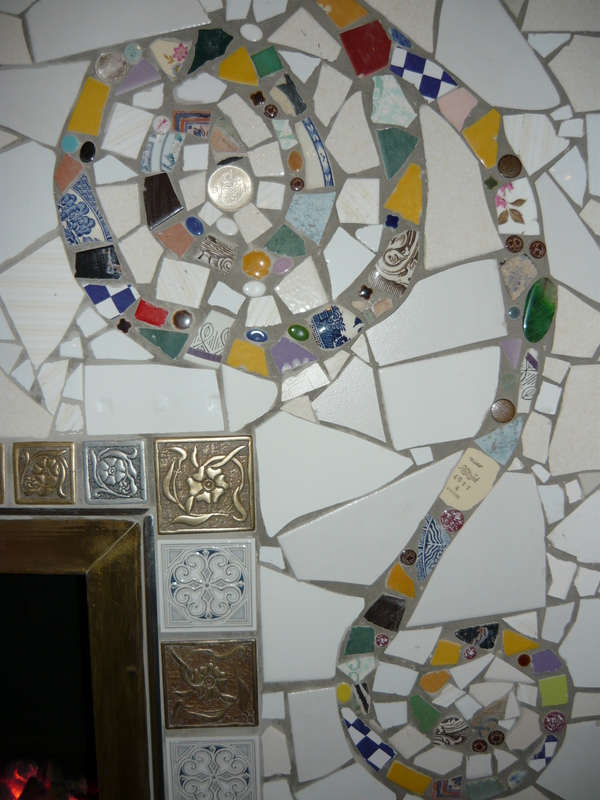 We really hope you will get inspired to try a mosaic project of your own. A table top, flowerpot or pot stand will get you going and then there will be no stopping you. ← Building a Gazebo with a living roof. Part 2.